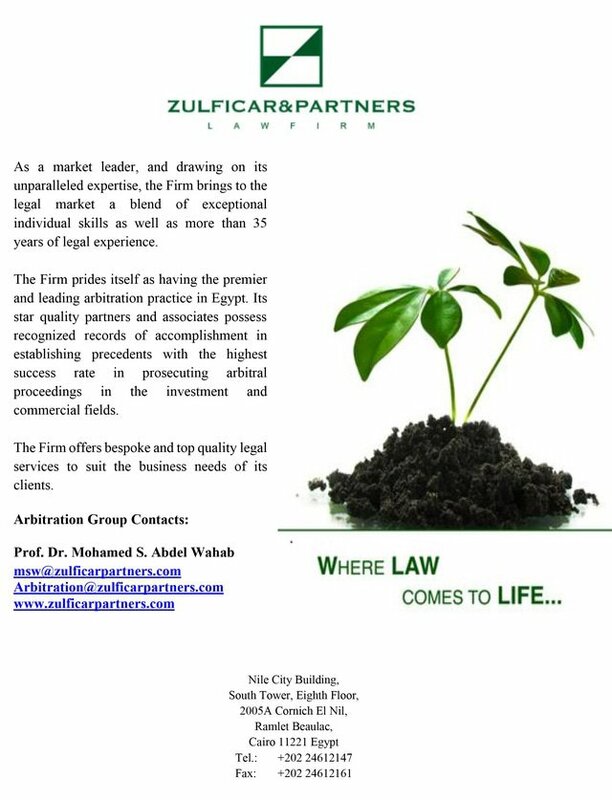 Founded in 2009, this Cairo-based firm’s international arbitration practice works on oil and gas, telecoms, finance and banking and IT disputes. The practice is headed by partners Mohamed Abdel Wahab and Ingy Badawy. As an Egyptian firm, naturally much of its work involves disputes at the Cairo Regional Centre for International Commercial Arbitration (CRCICA). But it also has a number of SIAC, ICC and ad hoc cases on its books and has done work at ICSID. Abdel Wahab, who also heads the firm’s project management practice, has the biggest international profile of the group for arbitration. He is a member of the CIETAC panel of arbitrators and the LCIA Board and a vocal proponent of the use of arbitration for resolving Islamic finance disputes. He is also a member of the IBA’s core advisory group that is considering reforms to investor-state arbitration. He featured in Who’s Who Legal Thought Leaders in international arbitration in 2017. The arbitration team also includes partner Youssef Al Saman and eight senior associates in addition to a number of juniors. Clients include Cemex, Bechtel, Bawabet Al Kuwait Holding Company, Crédit Agricole, Dragon Oil, Philip Morris International, British American Tobacco, Orange, Total, Egyptian General Petroleum Company, Ford, Honda, Hyundai Heavy Industries, Goldman Sachs, Iberdrola, Alghanim Industries, Arab African International Bank and APM Terminals. The firm has also represented Bahrain and Canada. In 2017, Zulficar helped mobile operator Orange Egypt (formerly Mobinil) settle an eight-year Cairo Centre arbitration with an Egyptian state-owned telecoms company over interconnection fees. At the time of the settlement, the tribunal had already upheld Orange’s claim in principle and dismissed a US$1.8 billion counterclaim by the state entity, but had yet to reach a final award on damages. The year before, as co-counsel with Clifford Chance, the firm helped Bawabet Al Kuwait Holding Company – part of the business empire of Kuwait’s wealthy Al-Kharafi family – settle a five-year-old ICSID claim against Egypt. The claim, worth more than US$400 million, concerned gas pricing and tax measures that affected a petrochemicals investment. The terms of the settlement weren’t disclosed. The firm has had a number of successes for Egyptian General Petroleum Company (EGPC). In one London-seated case, the client only got the firm involved 18 months into the proceedings, having failed to retain external counsel before that point. Zulficar nevertheless turned things around and won an award with costs in EGPC’s favour. It also helped EGPC settle a US$200 million claim brought by Egyptian oil company PICO, shortly after filing a statement of defence. The firm acted for an Egyptian developer, SODIC, in a US$1.6 billion dispute with Lebanese developer Solidere; a favourable decision on jurisdiction was delivered in 2013, which led to the dispute being settled the following year. It defended a subsidiary of Orascom in a US$390 million gas pricing dispute with two Egyptian state companies, EGAS and Gasco, at the Cairo Centre. Another result was making sure Arab African International Bank was excluded from a US$62 million banking claim by Kuwaiti investment company Osoul Holding Group. In the Egyptian courts, the firm helped the production company of Egyptian satirist Bassem Youssef overturn a US$14 million award in favour of Cairo TV network CBC. The Firm secured a win and an award on costs for Cayman-registered Shelf Drilling in a US$2.5 million CRCICA case against Texas Oil & Gas Services. The firm has been advising Egyptian real estate developer Amer and its Syrian subsidiary in a US$500 million CRCICA arbitration and related court proceedings against a Syrian special purpose vehicle over a tourism project in Syria. Last year, the Cairo Court of Appeal issued an order terminating the arbitration proceedings following a complaint from the Syrian company that the arbitration was taking too long. Zulficar has since assisted Amer in appealing this judgment. During the past year, the firm has been instructed in a number of major construction disputes in Kuwait, Doha, and Oman. In addition, the firm has taken on its second case in Japan (and claims to be the only Egyptian firm to be involved in Japanese cases). As arbitrator, Abdel Wahab sat on a Libya-seated panel that awarded Italian construction company Gemmo €5.98 million in a claim against Libyan European Hospital (LEH). He also headed a committee that drew up the constitution of the Africa Arbitration Association which launched last year. The firm added to its arbitration team with the hire of two senior associates and three juniors. Abdel Wahab attended a gala dinner in Zurich where he received the Swiss Arbitration Association’s biennial prize for advocacy in international commercial arbitration. He is the first practitioner from Africa to receive the award. One lawyer from an international firm who has worked as co-counsel with Zulficar says Abdel Wahab has done a huge amount to keep Egypt on the map from an arbitration perspective. “He is a pleasure to work with and his sharp intellect shines through,” he says. Our solid and world-class arbitration practice is founded on a combination of knowledge, expertise, creativity, and strategic dispute management. We pride ourselves as market pioneers in the world of arbitration, where we regularly prosecute cases under major institutional rules and in ad-hoc proceedings. The Firm’s Arbitration Group is successfully able to conduct international arbitral proceedings in diverse jurisdictions, under various laws, and in different languages with highest standards of efficiency and professionalism. The Firm’s Arbitration Group is well positioned and recognized for successfully prosecuting high value and highly complex arbitral proceedings with an exceptional track record of excellence. Amongst its most recent case load are commercial and investment disputes pertaining to telecommunications, power and infrastructure, construction, oil & gas (including gas pricing disputes), hotel management, sale of goods, financial services, real estate development, maritime and transport, commercial representation, and joint ventures. With a proven track record of success and owing to its unique standing in the region, we are increasingly instructed to represent investors and governmental entities in arbitral proceedings spanning the business and investment spectra under major institutional rules including the CRCICA, ICC, ICSID, LCIA, SIAC, etc., and in the context of ad hoc proceedings governed by the UNCITRAL rules, the English Arbitration Act, the Egyptian Arbitration Law, etc. The Firm’s Arbitration Group is headed by Prof. Dr. Mohamed S. Abdel Wahab who, in addition to being a Founding Partner of the Firm, is recognized as a world-class leading arbitration practitioner, who regularly features in international arbitration proceedings as arbitrator, counsel or expert. The Arbitration Group also includes more than 20 highly talented associates who specialize in prosecuting arbitral proceedings across the investment and commercial spectra. Growing at an accelerated pace, the Firm has already established itself as a market leader and precedent maker, where it is regularly ranked as the top tier practice in notable directories including: Chambers & Partners, Global Arbitration Review (GAR), Legal 500, IFLR and IFLR 1000. Since 2015, the Firm is the only Egyptian firm featuring amongst the GAR 100 Guide to leading international arbitration firms. In 2017, the Firm was awarded the Global Arbitration Review “Mediterranean or North African international arbitration practice that impressed in the past year” at the GAR Ceremony held on 29 March 2017. In 2017, Prof. Dr. Abdel Wahab has been selected to feature in Who’s Who Legal Thought Leaders: International Arbitration (2017-2018), and the GAR Global Guide for Future Leaders in International Arbitration (2017 - 2018). Prof. Dr. Abdel Wahab features in AFRICA’s 100 list of leading African arbitration practitioners by I-ARB (Africa) and was selected by Africa Arbitration as the African Personality of the Month (June 2018). Prof. Dr. Abdel Wahab received the 2018 ASA International Arbitration Advocacy Prize and was voted the Legal Practitioner of 2017 by the LAW Magazine. In 2018, Mrs. Mona Zulficar, Founding Partner & Chair Person of Zulficar & Partners law firm, was recognized by IFLR Middle East Awards 2018 for the “Life Time Achievement Award” for her exceptional and tireless efforts of influential and innovative work in the corporate finance and regulatory practices, as well as impressive achievements in other fields. The award marks Zulficar & Partners as not only the first Egyptian to receive the award, but also the first woman globally.